WarfareSims.com is a copyright of WarfareSims Ltd.
All Command: Modern Air/Naval Operations scenarios are © their respective designers. 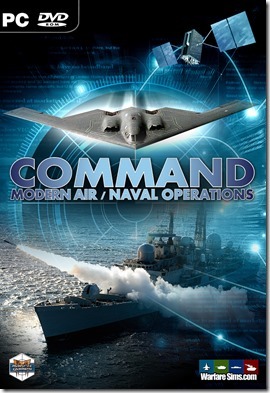 The Command: Modern Air/Naval Operations databases are © WarfareSims Ltd.
All computer Harpoon scenarios and databases is licensed under a Creative Commons Attribution-Noncommercial-No Derivative Works 3.0 Unported License. You may copy, distribute and transmit the computer Harpoon Scenarios and Databases and all or parts of its content, but not derivative works based on it without the express written permission of the author. You may also adapt the databases to your own needs under the terms of fair use. By doing so, you agree to fully attribute the author of the database. The databases or scenarios may not be used for any commercial purpose whatsoever without the express written permission of author. The 1980-2015 DB2000 Harpoon3 database is © HarpoonHQ. The 1965-1979 Harpoon3 database is © Quinton Van Zyl. The 1950-1964 Colonial Wars Harpoon3 database is © Paul Bridge. The 1939-1945 World War Two Harpoon3 database is © Tom Herron. Harpoon (and all game variations), Staff Assistant and Battle Set are Registered Trademarks of Larry Bond and Chris Carlson. All versions of Harpoon Classic 2002 and Harpoon III are © 2003 Advanced Gaming (AGSI). Earlier products (Harpoon, Harpoon Online, Harpoon Classic, Harpoon II) were copyright various firms but all rights have expired and are reserved by AGSI. Harpoon 4 was © by Ubisoft but is now © Larry Bond and licensed to AGSI. We take no responsibility for the correctness or quality of the information surrounding this home page or whatever damage direct or indirect caused by the home page or any of the downloads. All military information on these pages comes from unclassified material found in books, magazines, web sites and mails from fellow wargamers and military enthusiasts. This site hosts a number of images obtained from various web sites. If you are the legal owner of an image and would not wish for it to be hosted by WarfareSims please contact us in order to remove it. Your use of our website, forum, scenarios or database implies that you have read and accepted these terms and conditions. 1) Our website grants you nonexclusive access to articles, forums, scenarios and databases created and maintained by members of the Harpoon and Warfaresims communities. Community members that have created the content own the copyright to any articles, scenarios or databases they have created. 2) Any contents on this site shall not be used in conflict with the interests of the Warfaresims.com site or any of its members. 3) You may not offer any of the WarfareSims content for redistribution or resale of any kind without prior written consent from us. You may not claim intellectual or exclusive ownership to any of our articles, scenarios or databases, modified or unmodified without prior written consent by the copyright holder. The Warfaresims.com personnel reserves the right to change or modify these terms with no prior notice. There are many people who deserve our thanks for their help and support building the DB2000 database. We are indebted to Mr. Jon Reimer and Mr. Richard Rogers for developing their MS Access Database Editors. All database additions/changes made after April 1999 have been made with these editors. We would like to thank Gary Paulwell for providing us with tons and tons of accurate information on military platforms, and for helping us develop the new sonar model. We would also like to thank Oliver Einhaeuser, Darrel Dearing, Pete, Kelly, Daryl Burke, Jens Meyer, Peter Grining, Terje Askvik and Kirk Martin and all members on the Harpoon forums and mailing lists for their help and support developing the new sonar model. All members of the Harpooner’s Point forum, the Wardroom Harpoon Discussion Mail List, H.U.L.L, Convergence Zone and the Teleport lists. Without your support and help these projects would not had been possible. Alex, Andres Asenjo, Gianni Bartoli, Klaus Behrmann, Martin Björnström, Eric Bohley, Paul Bridge, Angelo M. Buongiovanni, Clint Chastain, Ruud Deurenberg, Dimitris Dranidis, Chris Elliott, Peter Ericson, ET, Jay Gibbs, Daniel Hayes, Steve Hellyar, Dale Hiller, Tom Herron, Andrew James, JC, Jeff Jones, JIVA, Chris Kakris, Drew Lewis, Jeff Loshaw, Joseph Lukacs, Scott Malensek, Marcelo Machaczko, Stephen Mills, Mike Mykytyn, Mark Olivares, Sebastian Palm, Jim Patrick, Kevin Peltz, Marcelo Pozzo, Kirk Martin, Ralf, Ken Rehor, Jon Reimer, Luigi Varriale, Bill Williams, Sheeren Zaidi, Jarek Zgoda, Quinton van Zyl who contributed their knowledge to improve the database and scenarios. Larry Bond and Chris Carlson for making Harpoon possible.